Last year, their production of The Christians was one of the very best things I saw all year. Their production of Annie Baker’s The Aliens just a few months before that was also fantastic. From their Fringe Festival beginnings with The Lives of the Most Notorious Highwaymen, to live action puzzle boxes like 1926 Pleasant or Saboteur, to more recent high points like Gabriel, Walking Shadow always puts on a hell of a show. Then they’ll do something where I feel jerked around as an audience member with things like The American Pilot or Lasso of Truth or Mojo or The Coward or The Sexual Life of Savages or, most recently, The River - and I’ll be thinking, "Hey, cut it out, that hurt, why’d you do that?" To be clear, it’s not that I don’t want them to do that. I just want to better understand why. You can add their current production of Marie Antoinette to that latter category. Walking Shadow chose to produce David Adjmi’s script about the doomed French queen on the eve of the French Revolution well before the results of the most recent American presidential election. This isn’t a response to the reality of a President Trump. One wonders what lens we’d all be looking at this play through if we ended up with a second President Clinton instead. The play was originally commissioned and produced back in 2012, the year we reelected President Obama for a second term. But is anyone really asking me to sympathize with clueless rich people in power as my protagonists? Or to think of the people protesting and rioting in the streets in order to change their way of life for the better as the bad guys? Current events seem to be fighting this play pretty hard at the moment. 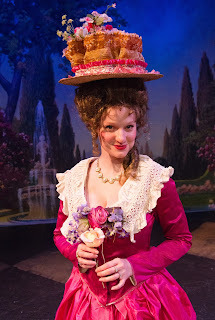 Cognitive dissonance is the order of the day, and this production of Marie Antoinette serves it up in fine style. If you’ve seen any other Walking Shadow production, then it will come as no surprise when I tell you the show looks stunning. Annie Henly’s set is spare, but populated in just the right way by Sarah Salisbury’s props that you get a feel for the opulent Versailles. Katherine B. Kohl’s costumes (and of course all those wigs by Robert A. Dunn) do a lot of the heavy lifting for the show by being WAY over the top in a way that nails the excesses of the French monarchy perfectly. With Michael Croswell’s sound and music compositions, it’s the little things that knocked my socks off. Marie has a line (just before everything starts going down the crapper), saying at the end of a scene, “I still feel there’s something inside of me that’s trying to get out. A little bird flapping its wings at the inside of its cage.” As she moves to go and the lights begin to fade, we hear the sounds of a bird’s wings (which I know sounds obvious, but the clarity of the sound and volume at which it’s pitched made it the perfect ominous foreshadowing for me). The acting ensemble is stuffed with fine performances, led of course by Jane Froiland as the title character. Her character embodies the tough to love/tough to hate aspects of the play perfectly. She’s a smart choice around which to build a production. Just as you start feeling bad for Marie Antoinette, she’ll do something off-putting, more likely say something off-putting. She regularly swears like a sailor but that isn’t as offensive as some of the breathtakingly clueless things she says that have no grounding in everyday reality or empathy for common people. You could try and feel sympathy for her as a parent who lost a child. And you want to feel bad when she’s separated from her remaining young son (Hal Weilandgruber) late in the play, but you just saw her shove him away from her only minutes before. Hardly mother of the year material. Marie Antoinette’s marriage to Louis XVI (Zach Garcia), like nearly all royal marriages at the time, was more international power-brokering between countries than a relationship grounded in any genuine bond of affection. Louis seems just as clueless, if not more so (if that’s possible) than Marie about the real world their royal bubble of privilege exists in. Teresa Mock and Derek “Duck” Washington help round out the “haves” in this society, with Julia Alvarez and Anna Sutheim filling in some of the “have nots.” Meanwhile, David Beukema and Suzie Juul do double duty in multiple roles both high society and lower born. Paul LaNave stands out for embodying the menace and danger of the French revolutionaries. And just for good measure, we have Neal Beckman as a horny anthropomorphized Sheep, who also doubles as a harbinger of doom. Adjmi’s script is both poetic and profane. It manages to make these shallow people just human enough to sympathize with, then promptly reminds you why they don’t deserve our sympathy. The production jerks you back and forth just like the script wants it to. In fact, the only real stumble in presentation is the often unnecessarily long scene shifts. It feels like the changing of elaborate costumes and wigs is often the culprit here. But even the movement between scenes where that isn’t a factor seems to leave us in semi-darkness much longer than it needs to. A brief window of time between scenes, for us to digest what’s going on, isn’t necessarily a bad thing. But if it goes on too long, then we start to drift away from the story and you have to spend precious time in the next scene dragging us back and rebuilding the momentum of the tale. Also, while there was gorgeous work done on a painted backdrop by Wendy Wazut-Barrett, a handful of the supertitles projected on that backdrop weren’t fully visible to anyone who wasn’t sitting right in the center section of the house. They probably should have sat someone off to the side to watch while they were incorporating the projections to catch that. And given the fact that it’s a fairly large backdrop, centering some of those longer titles in shorter bursts and using up more of the wall, top to bottom, to project them on might have solved that problem.